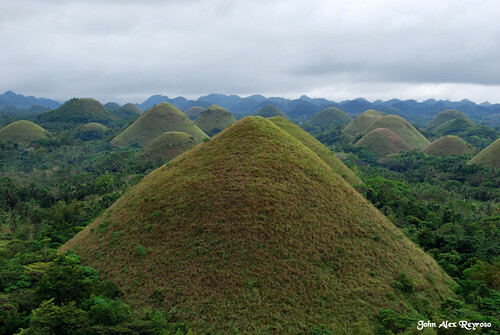 The Chocolate Hills are a remarkable rolling terrain in Bohol Island of Philippines. The central area of the Island has an array of about 1,776, almost symmetrical grass covered conical dome shaped mounds spread over an area of about 50 kilometres. The mounds are scattered throughout the towns of Batuan, Carmen and Sagbayan in Bohol, with largest concentration near Carmen. 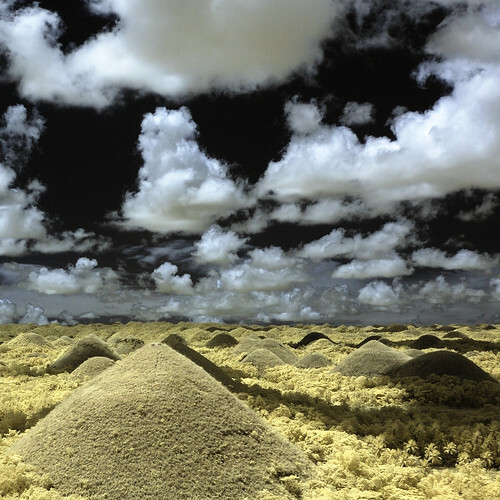 These cone-shaped limestone mounds vary in sizes from 30 to 50 metres high with the largest being 120 metres in height. During dry season the grass dries off and the whole region turns into chocolate brown landscape - hence the name - Chocolate Hills! The mounds are unique in a sense that the only other known formation of similar type is in the island of Java but those are not as regular in shape/cone form and size as the Chocolate Hills of Bohol Island.
" ..... These include simple limestone weathering, sub-oceanic volcanism, the uplift of the seafloor and a more recent theory which maintains that as an ancient active volcano self-destructed, it spewed huge blocks of stone which were then covered with limestone and later thrust forth from the ocean bed. ...... Still another way the origin is stated is that they were formed centuries ago by tidal movement and by the uplift of coral deposits and the action of rain water and erosion. Another theory is that they were ancient coral limestone reefs shaped by many thousands of years erosion by both water and wind. Geologists think that the specific shape of the hills is caused by the influence of the weather over millions of years. The break down of the upper layers of the limestone formations, followed by the erosion processes, resulted in these cone-shaped remnants. It is likely that they were once limestone deposits beneath the sea, uplifted by the movement of plates and then smoothed by wind and rainwater erosion."